The Duchess of Sussex was spotted leaving a business lunch in Notting Hill yesterday with deputy press secretary Christian Jones. Since Harry and Meghan announced their engagement, the couple have managed to keep under the radar whilst enjoying nights out at the theatre. At Cirque du Soleil on Wednesday, the couple revealed they had seen the show only eighteen months ago. Foodie Meghan has dined at several of London's best-known eateries with friends over the past year. Today, marked only one of a handful of candid snaps we've seen. Click here to see several photos available at the Mail Online. 'Meghan has been spotted on a business lunch with a new key appointee after Kensington Palace hired the former Brexit speechwriter for David Davis as its deputy press secretary. He became deputy director of communications for both Meghan and Harry and William and Catherine in December, after racking up nearly seven years of experience working with two Government departments. The Cardiff University graduate served as Mr Davis' speechwriter at the Department for Exiting the European Union from October 2016 to September 2017, before taking up a new role as the department's press secretary. Prior to that he was chief press officer at the Treasury from November 2014 to October 2016, serving under George Osborne and, for a brief period, the current Chancellor Philip Hammond. Although Meghan is expecting her first child later this spring, she is said to be determined to make as much impact as possible with her patronages, charitable visits, preparing future projects and plans to undertake a tour in the autumn. With reliable reporters claiming we'll see the Sussexes and Cambridges separate and have their own offices in the near future, it may be possible plans for that are taking shape and preparations are already in place. Given Mr Davis' Brexit knowledge, I imagine he's been briefing the royals especially as a number of members of the family have been deployed around Europe already in an effort to bolster relations. They dined at Italian restaurant, Chucs in Westbourne Grove. Chucs Restaurant is the sister concept to the 1950s-inspired swimwear and men’s fashion label of the same name, founded by Charles Finch. 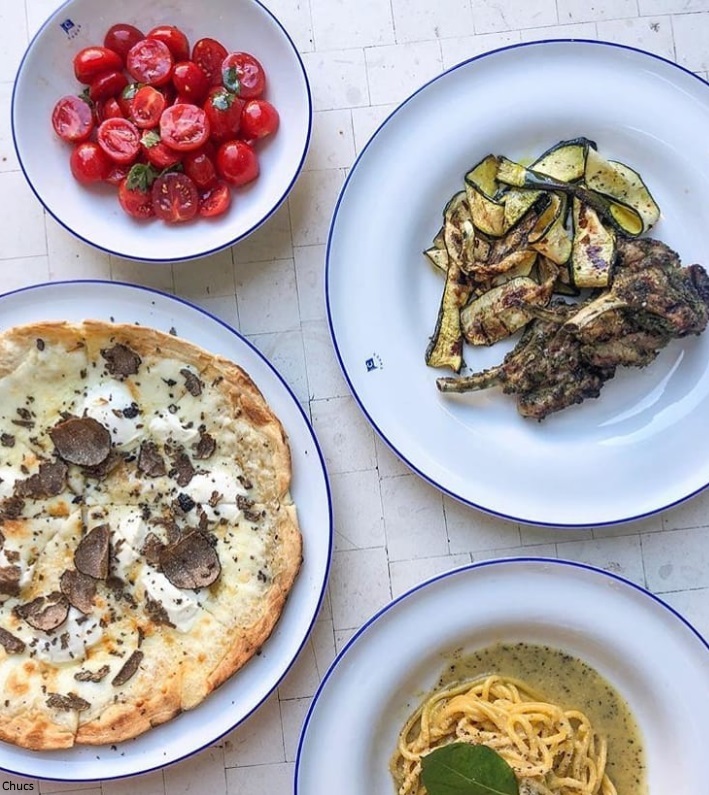 Under the direction of Head Chef Alessandro Verdenelli, Chucs Restaurant & Cafe now spans four London locations - Dover Street, Westbourne Grove, Harrods, and the iconic Serpentine Sackler Gallery in Hyde Park, serving up Italian classics. The menu includes a selection of favourites served all day: Maccheroni Bolognese, Saffron Risotto, Fresh Spaghetti with Truffle, Grilled Fillet of Sea Bass, Sicilian Caponata, a selection of pizza's, Tiramisu and Gelato. The Duchess looked casually chic in a navy coat and distressed jeans. Meghan's Mirror suggests it's likely Meghan wore the $40 H&M Mama Boyfriend jeans. Described as: "Jeans in washed denim with heavily distressed details. Mock fly, mock front pockets, regular back pockets, and wider, tapered legs. Wide jersey ribbing at waist for added comfort." We saw Meghan in a £25 dress from the same maternity range for a visit to Mayhew on Wednesday. 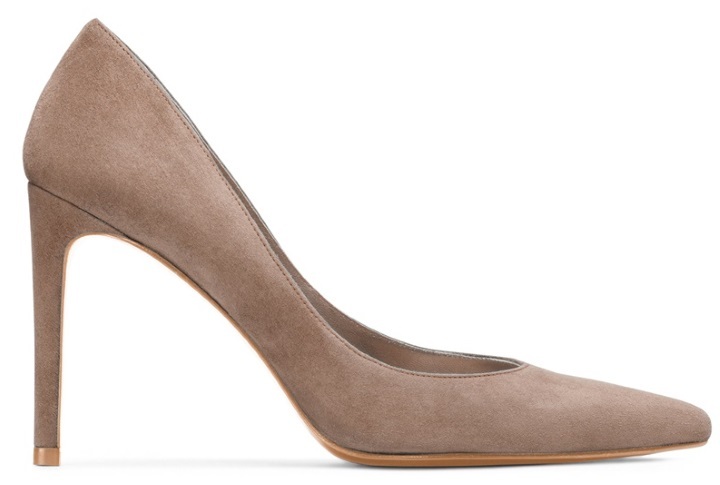 Meghan wore her Stuart Weitzman Legend pumps in haze beige. Meghan carried her Mulberry Zipped Bayswater tote. The sold out bag is described: "The Bayswater is our most iconic bag, and its eponymous collection includes new styles inspired by the original. The Zipped Bayswater is the perfect option for those who like a zipped closure. Using the same construction as a Bayswater, this new style plays with the detail – deconstructing the front by removing the flap and using the iconic postman's lock to secure two belted straps." 'The Duke and Duchess of Sussex are expected to move out of their Cotswolds bolthole within weeks. The couple took a two-year lease on the £2.5million former farmhouse in a picturesque hamlet in the run-up to their wedding last year and spend most weekends there. The article suggests expenses and security were both factors in the decision. My guess is the latter played a significant role. In recent weeks, photos of the property have surfaced online and perhaps with security, it was no longer felt the location could offer the same level of privacy it once did. With Frogmore Cottage due to be ready in just a few months, they obviously feel the Windsor estate offers a slice of the country life they enjoy and was the ideal place to bring up their family, negating the need for another country home. That's a shame about their Cotswold property. It's a beautiful area and I'm sure they've enjoyed the privacy and the great walks they've been able to have in the country side. But as you said Charlotte, the exposure and pictures of their house have probably raised security concerns especially since it looks like someone was able to take an aerial picture probably using a drone camera. Hopefully they can have the privacy the want and deserve in Frogmore. Question about their new employee; Is he a replacement for Jason Knauf? I didn't know he left. Finally, it's great to see Meghan's pre-royal style. I'm not a fan of ripped jeans but I know Meghan is and it's nice to see that she's still able to wear one on her private time. Also, I love her tote bag. I know she's owned this one for years and she owns it in another colour as well. Interesting to hear that they’re vacating the Costwolds rental early, but it makes sense since they’ll have Frogmore ready soon. No real need for two country homes. I wonder if they’ll also keep NotCot until their family expands some more, or set up residence in BP like Edward and Sophie. I dubbed her the "Queen Of Casual." That look she can create with different pieces is just my favorite. It was photos of her dressed casually in Toronto, when I first discovered Meghan and I admire her so much. Yes, I think the photos of 5he place splashed all.over the daily mail probably forced the move. That's too bad as they are supposed to really like the area too. But this is a very nice pr move by meghan to be seen.publicly with staff. A nice counter to the stories of how the staff hate her and her workhorse ways. And I think that’s exactly what a lot of people think this is. A pr move of some sort. I tell you, the commentary surrounding Meghan is exhausting sometimes. On a similar note...I thought Samantha Cohen left already? This was one of the "damning evidence" about Meghan being difficult and losing staff. But looks like she's still with them. These photos were most likely as a result of a tip off to photographers that Meghan was having lunch at this restaurant . I really don't think the luncheon with the Deputy Director was meant as a photo-op for several reasons. First, I think that nonsense about Meghan's causing staff to quit is hogwash. Also, she seems to be trying NOT to be seen.Meghan is wearing sunglasses on a day not particularly sunny, she has her collar pulled up around her face, and she has her head bent down. She is wearing ripped jeans, which-the best I can recall, she has not worn for a public meeting since Toronto games. In addition, it is puzzling to me why she would meet alone with him without other staff or the Cambridges. as he also represents the other couple.There is plenty of meeting space at KP for such meetings but a meeting held there would more likely be noticed. I am not even sure that is a pap photo. If it was a pap photo I think the most likely scenario is a restaurant employee or guest alerted them, not Meghan. I think more likely a by-stander with phone in hand getting a lucky shot. As a side note, this appointment was announced weeks, if not months ago. I recall being impressed with the caliber of his experience and thought it nearly comparable to that of Ms. Quinn's. My guess is that he will be primarily a Sussex employee if and when the two offices separate, as has been speculated. That is the only context in which I can explain this luncheon get together. Doesn't mean there could not be another explanation. I just cant think of one at this point. I did not yet see the Navy 3/4 length coat I.D., hope someone will. I like the style. This is cute. I wouldn’t have done heels, but I rarely wears heels anyway. Ripped jeans became what I thought was a fad when my daughter, now 50 years old, was in school. The fad has become a fashion, obviously, but it still strikes me as a bit unsightly. So, I am an old fogey. You are not alone, Patricia. Simply put Meghan at work or off duty the girl knows how to put a look together. Fabulously chic today. I really enjoy Meghan's pre-marriage style and I'm sure she's thrilled to find a pair of comfortable, ripped jeans that will accommodate her growing belly. It's also nice to see her continue to use the accessories that she had before the wedding. Much has been made of Meghan's clothing cost but I think once the baby's born we'll be seeing lots of re-wears and even some mash ups of outfits we've seen before. In regards to quitting their Cotswold home, Frogmore Cottage is well suited to act as both a main residence and a out-of-town residence, given its location. I don't believe that any of the other family members, excepting Charles and William, have two homes, most have an office/apartment at BP or St. James for work but only have one main home. Love the combo of coat and destroyed denim. I love seeing her off-duty style - relaxed yet chic. What a shame that their privacy was invaded with the publication of the location of their Cotwold botlhole. I imagine it would be impossible for them to recover their privacy, with paps probably a risk now whenever they are there. Well, at least they appear to have enjoyed great privacy for a short while. The new communications person is not working for just Harry and Meghan? I thought I read that he would work for all four royals. It was a nice surprise to see casual Meghan. I think she looked so much like her she used to in Toronto. She looked fabulous-absolutely adore her coat with what looks like a slight swing silhouette. She looked great in her maternity jeans, too, although personally I could never see the point of distressed jeans. I think the Cotswolds was only ever going to be a stop gap, while they get their housing sorted out. 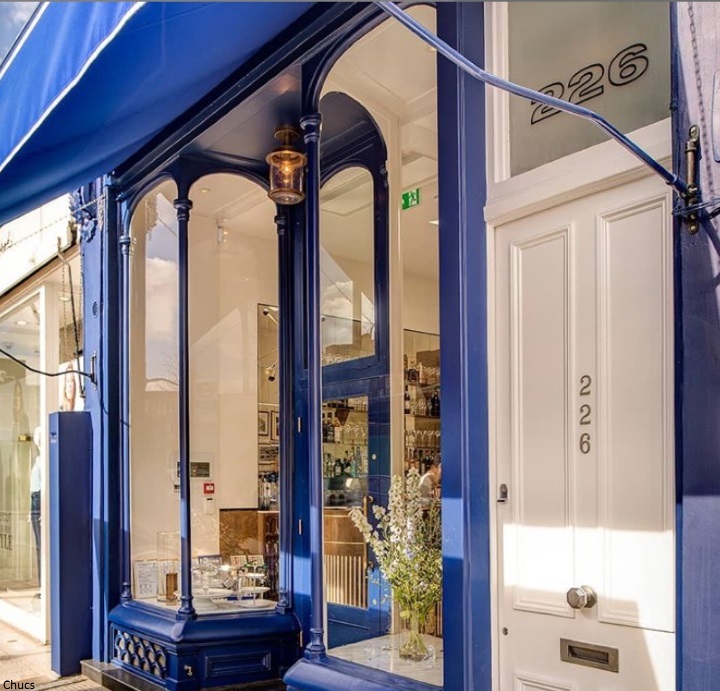 A bolthole for Meghan away from the London fishbowl and a place to host friends. When Frogmore was announced everybody just assumed that they will keep the Cotswolds, since they had a two year lease, but I never bought into that. If they wanted to keep the Cotswolds, some serious money would need to be spend on upgrading the security. You can’t bargain on nobody knowing where it is as a security measure. And while that money would have come from their personal pocket it still does not look good to spend huge amounts on two houses, when there are lots of people who can even afford one. So opticswise I think this is a good move. I think the reality is they rented before they were married and now they are married they may have been given other properties in Sandringham and Balmoral that we don't know about. There is also Highgrove which is very close to the Cotswolds to hang out in. Obviously, the lease is ending when the baby is due. It may not be to their family of three wants and needs. Agree Anon 8:33 and Florida Moxie. Think ending the lease is unrelated to security or finances. I was surprised to see photos of their Costwolds rental , I suppose Harry was fuming just like when he had to hastily come back to UK because a journalist hadn’t revealed he was deployed with the army ..... I can’t understand readers who buy that kind of informations ! I admit liking to see candid pictures, but I never buy any magazine especially for that ! I sometimes feel curious about the way these wealthy people live and act, but ... let be curious and imagine ! Commenting on a blog in a second language is tricky and I greatly admire anyone who attempts it, especially as well as you do, Nicole. In fact, your use of English idiom amazes me a times. I want o point out the difference between referring to someone as a "coloured woman" compared to the phrase in use currently, "woman of colour." The former is dated and carries a huge amount of negative meaning, historically. I did not know about the Cotswold house photos until I saw it here. It is a shame but, truthfully, I was surprised the couple were able to keep it quiet as long as they did. It is close to some of Meghan's friends and acquaintances as well as a lovely area. I think the idea was to escape the royal ambiance for a respite from time to time. Windsor living is away from London and serves as a getaway in that sense but it is really not an escapes from royal pressures. Annon 19 Jan 18.32 thank you for your compliments , and more than that, for your help ! I learn a lot’ from this blog in any ways, clothes, British traditions and laws, reactions from people of different countries, and while I comment I sometimes fight to find the right word (that awful feeling ... I know the word and can’t remember it right now !) and I sure will take a note right now about the right term « woman of colour » , it is such a touchy point nowadays that I do not want to sound rude or insulting ! Thank you again from France ! Haha! Nicole. I know what you mean about word- finding. I have the occasional "senior moment" using my native language. Seriously, I was worried you would use that term somewhere less friendly than here. I did not want you to experience the ire the use of such a term can elicit, especially when you did not intend to offend. The term brings up a very painful part of history in the USA. On the other hand, "woman of colour" is used as a term of pride, especially if one is referencing oneself. It includes those from multiple ethnic backgrounds. Honestly I'm glad they're leaving the cotswolds behind. I always thought the extra security cost associated with them choosing a home outside of current royal residences is an unfair and wholly unnecessary burden on the taxpayer, given the tons of royal homes and apartments in palaces already available to brf members. Obviously they would always have needed some time to renovate a long term residence but Id be shocked if they couldn't find something else on Sandringham or something for short term residence if Nott Cott was that unbearable even just for a yearish. Anyways hopefully frogmore is a lovely home for them. The cambridges have two homes. And while amner is owned by the queen, its not a royal residence because it's on a private estate isnt it? Not sure how that works because sandringham is the queens personally. And they leased a house on anglesey so there is.precedent for leasing. That being said I do agree.its.more cost effective to spend all that money on something you own. I agree that the Cotswolds rental is a similar situation to the farmhouse the Cambridges rented in Anglesey. A temporary solution while they are in a limbo stage of living together but not being married yet. Can you image the headlines if HM gave William/Harry a house on a royal estate and Kate/Meghan started to renovate and decorate and spending taxpayers money while still only a fiance. Now that they are married and will have a permanent royal residence there is no longer a need for the rental. I don't know why the uproar in the news about ripped jeans being disrespectful to the Queen, unroyal, etc. She is on her own time and she looks very young and chic. She is in amazing shape, too. I have my own reservations about Meghan that I will keep to myself but that being said, this girl cannot catch a break. As much as Harry and the Palace tried to prepare her, and as confident as she was that everything would be fine as long as she had Harry by her side, no one could have predicted what she is facing. I saw a video as Harry and Meghan stood while being introduced at the Albert Hall and there was audible booing. Harry's face was rather stony while Meghan managed a smile. Her acting skills come in handy in such situations but it must hurt deeply. I hope that this is an OK topic for discussion because I am just baffled by the venom. What is going on? Csn you post a link with that video....no where have I seen any information about Meghan bei g booed....with the amount of media that was at the event, something like that happening to Meghan would have been FRONT PAGES NEWS ALL OVER THE WORLD! Beth, I don't know if that's an Ok topic, but I have a theory to answer your question. IMO, the PR strategy about Meghan was not clever. She was presented as someone who was going to change things, do it her own way. People were bound to resent that. Usually people everywhere have the same reaction to foreigners not adapting to their new country. It happens in the UK and everywhere, the newcomers have to learn the ways of the country, if they don't they get a negative reaction. I think the approach should have been humility. A few sentences from Meghan saying she feels it is a huge change, she feels so honored to be adopted by the UK, it will be difficult but she will do her best...a bit of praise of the UK, wonderful country, people so kind ... even if Harry felt she was wonderful and perfect for the job, and even if she was, it would have been better letting people find that out for themselves. IMO she would have attracted more good will had she not been perceived as bragging. Another avoidable mistep is the excessive spending. Regardless of who pays for what and repeats or not, it is being tone deaf. It creates resentment. There is a reason Queen Letizia wears so much high street. It is important to win people over, not to take their approval for granted. And you can't hammer into people that they are wrong because they do not like her, it only adds to the dislike. If they keep calm and go on, like the RF is used to, it will get sorted after a while. Now the focus is on them, but time will make them less of a novelty and the critics will disminish. Some of it is good old-fashioned racism. Some of it is I think the turmoil that is going on in England -- look at the chaotic Brexit vote the other day. However, I'd take the comments section of DailyMail with a grain of salt, as it's been proven that DailyMail not only generates "fake news" but also generates fake comments to make more views to their site and thus revenue. Would you be able to post a link to the video where you heard booing from the crowd? I've seen a few videos but I didn't hear any booing. I like to see and hear things for myself, I hope that's okay. Thanks. I'm sure you could voice your reservations if you wanted. It would probably open up interesting conversation. Personally, I think Meghan has taken to the role beautifully. There are times where her smiles seem a little overdone, but I can't fault her, because it's a lot to take on and I'm sure she's been nervous at times. I didn't realize anyone booed them? That's just awful. So immature and disrespectful...of anyone! I think in the current world climate, hatred has been tolerated more and more, so trolls have come out of the woodwork to join the fray. I'm sure some of it has to do with her being an outsider (American). None of it is founded, in my opinion, but I think those who are inclined to write and say hateful things will jump on whatever bandwagon they can find. I made a comment last night on the post where she was at the event about that. I saw the video. I couldn’t tell if the booing was real or if it was something people somehow edited in, but either way, how very sad for them. BethNY thanks for bringing the video to my attention. I had not seen it and I am with you - this resentment toward her is mind boggling. I do not believe there was near the boos as cheers and applause (at least to my ears), but regardless it is so disrespectful. Harry looked miserable. I also think H makes some excellent points about the lack of PR strategy and preparation. In all, I do hope things calms as they become less of a novelty. After all Harry has been through, to have his wife receive this level of interest and criticism must be daunting. God bless them both. Forgive me, @H, but Meghan has complimented and praised the UK and its people, she's thanked people for being welcoming to her, she's said she'll work hard and has been working hard. As far as I can see she's never presented herself as someone who's going to change the monarchy etc., which is why the rebel narrative, which I don't believe was a PR strategy from the palace (imo inclusivity was the BRF's strategy around her), never made much sense. And if we go by our own eyes, that pink/beige/colorless conservative period in her style came directly after the wedding. It seemed very much like she was trying to fit in and she was still labeled as a protocol breaker every time she stepped out (leg crossing, shoulder baring, messy bun, nylons) to cheers from people who wanted her to be a rule breaker and jeers from those who wanted her to blend in. This is in addition to allowing her father to trash and harass her in the media when she hadn't even been around long enough for people to be mad at her yet. As for spending, I've already talked about it and the fact that she should be aware of optics here. I was going to speak more in the fall, but the pregnancy happened, so the rest of my opinions will have to wait as I observe what she does post-pregnancy. While I don't agree with the tally that was allowed to spread in the media (gifts and pre-wedding clothes, come on), there is still valid discussion and critism there. I wish people would stop believing everything as presented by media. They're very blessed in the art of spin and there's little she can do about it. Prime example is Samantha Cohen, introduced by the media as an interim secretary sent by BP to help Meghan for six months, being used by the same RRs as an example of another staff member leaving because Meghan is just. too. difficult. back in December. It seems she's extended her stay for a bit as she's been pictured with them this week. Or the protection officer who's leaving the force entirely (implying a personal issue) being framed as another person who Meghan pushed out. Or Meghan the controlling wife forces Harry not to hunt on Christmas, except he did, so now she's a hypocrite who doesn't really like animals. And those are only recent examples. As I said in a previous post, the press takes facts and presents them how they like. Whether we choose to believe them is on us. The goal isn't convincing people to believe the stories, in my opinion. The end point is not getting people to "buy" their stories as fact.The tab owners could care less what people believe if they buy the news by clicking. The aim is to get people to talking via controversy- to be curious and motivated enough to click on the sites. Kate went through this, as well as other royals. Meghan was a blessing to tabloids because she presented with so much ready-made controversy. Less need to manufacture it. However, that does not stop them from doing so. If one deplores how Meghan is being treated by the media, one must stop supporting it by clicking and participating in it. It is not really effective to participate by arguing against or countering the trash because it just encourages it. No one is convinced to alter an opinion; meanwhile, the media forum that allows the trash is supported. Anon 21:52, can not agree more. Bethany, I agree! Another poster ("H" ) suggests Meghan hasn't been humble or grateful enough to her adopted home. I think not. She has often remarked on her warm welcome, ignoring the furor on social media and ignorant trolls, as she should. She's still herself, and no 21st Century woman can be expected to grovel in gratitude, surrender her entire personality and all her goals for a marriage, or an institution. Meghan has already made clear she wants to make an impact in her work for the family firm. She's been a workhorse her first year, and I don't think motherhood will change that. One of my mentors used to say , 'begin as you mean to go on', and so she has. She's not a shrinking violet, she's not a shy, pallid, indifferently educated, antiquated, member of the aristocracy, as I suspect some might have wished for Harry's bride. The woman he fell in love with is worldly, strong, dedicated, and smart. She will never be the bored, benignly smiling, second tier Royal in a silly hat. Thank Heaven. This is not to say she won't learn to temper her public persona as the years go by, that the Queen might not occasionally call her to account, as I am sure she has done over the years to her wayward, ginger grandson. And she will never be Kate, or Camilla, or Sophie, or the Princess Royal. She will forever be her amazing self. Huzzah! This reminds me of the creative writing exercise at school- here is a picture write a story. The creation could have been much less positive. My question is why the lunch meeting. Seems strange surely all four of the Royal employers would see their media man on an almost daily basis. So to me looks like set up for photos of the meeting to reach the media. On the report I expected the rental to be given up once it was announced they were moving to Frogmore. The two year lease would have been signed prior to a decision of which royal residence they would be allocated. Why would one pay rent on a country home when one has been gifted a country home no matter how idyllic the rental is. I find it surprising that ur is felt that Windsor would offer greater security. Any persons on public tour can walk about Frogmore within a stones throw if the cottage with iurpt obstructed view or security. You are correct, That is the problem with Frogmore. Some serious money will be spend on upgrading security around the cottage. And that will create some bad PR (this happens whenever the public purse spend money, same thing with BP renovations) but it will be easier to manage the PR if they don’t have another country bolthole that also cost money to secure. Just good optics. If they do want a real country house, they can always acquire one in a couple of years time. Frogmore due to its security issues always seemed an odd house to be gifted to Harry and Meghan? Maybe it is easier to be secured than it appears. ie Maybe some landscaping redoing paths and fences etc. After all I think Kensington Palace looks like the general public is just walking around the backdoors to some of the apartments. But I have not visited London in years and am basing this on photos/graphics of the various residences. Yay, pre-wedding Meghan is back! I'm not a heels-wearer and don't know how she copes being so pregnant, but she looks fantastic. I'm sure this move will only add fuel to the hate fire. I hope things calm down in the press once they're settled at Windsor. Charlotte, do you think the horrible vitriol aimed at Meghan will ever calm? After reading BethNY's comment, I went and watched those videos and was so saddened. No wonder Harry and Meghan want to vacate the "fishbowl," as it were, earlier than planned. It's just sad to me that two people trying to do actual good in the world are being torn to shreds at every step. The vitriol will stop when people stop clicking on it. If Meghan wasn't handy as a target someone else would take her place. The point for some is to vent anger and frustration. I saw some on a site and never went back. It is produced either by bots for a political interests or by those who are painfully unhappy with their own lives. Either way--there are better sources for royal news. If that sort of comment is still appearing on KP Twitter I think it is a disgrace. Eiher eliminate the comment section or hire enough help to properly screen it. KP posts are completely undermined by allowing such comments, in my opinion. Unfortunately, I can't see it subsiding for the time being, Becca. Meghan sells. Gutter gossip and disgruntled Markle family members ranting shifts more newspapers than positive stories. It's been alarming to see the spin used. For example, Sam Cohen was always staying on until the spring as a favour. She never intended to stay any longer. Now the implication is Meghan's run her out of the Palace. Without any basis, she was also accused of causing the departure of a protection officer. People's Simon Perry did some digging on this and it turns out the officer is leaving for personal reasons; he was told it has nothing to do with Meghan. We could talk for the remainder of the weekend about the nonsensical stories: banning Harry from the Boxing Day shoot (except he was there), breaking protocol (more rubbish), and determined to do things her own way (there's nothing individualistic about a woman working hard in the BRF, it's very much the norm). I understand and appreciate people gravitate toward certain royals more than others. Though, It is concerning to see such little interest in her work compared to gossip. I think that's a real issue the household are grappling with across the board. Younger royal fans are viewing the BRF as celebrities and not representatives and ambassadors for the country. I do know the reporters on the ground have been blown away by the time, effort and work she's invested into her role. Sadly, that's not headline grabbing. Running two blogs, from my perspective, the majority of people who actively dislike her have done so from the day the engagement was announced. There is no altering their opinions and there's absolutely nothing she can do right in the eyes of some. They have zero interest in her work or factual reports and quotes. Instead, their analysis focuses on assertions such as "she looks fake", "there's just something about her I don't like" and endless claims Harry is merely a bystander in his own life as Meghan railroads him. The vast majority of the hatred is coming from grown women which makes this situation all the more shocking. It's an ugly time in the royal community, and the only consolation is the fact it will eventually pass - because eventually credit will have to be given where it's due. Ambition is not a dirty word, especially when it's been channeled into a role with as much scope and potential to help charities and effect change as a royal platform offers. It's amazing to see she hasn't been afforded the opportunity to transition, to make mistakes, to learn. She spent six months getting to know the charity sector in the UK with over 100 private visits and meetings. If she lacked humility and was 10% as media hungry as some claim, why wouldn't she leak them? Why not have a pap 'spot her' arriving and leaving? The reality is she's been keeping her head down and working hard. It's a shame that means so little. We've seen a global conversation erupt over the past couple of years regarding the way women are treated, preyed upon and discriminated against. I would love to see that dialogue expand to focus on the treatment of women by other women. Incredibly well said. Very thought provoking Charlotte and hopefully your words will give readers food for thought. Thank you. As always, Charlotte, your comments make sense. Bingo Charlotte. Extremely well said. Thanks for sharing your thoughts, Charlotte. I know we all appreciate your blogs very much! I think she was introduced into the royal family too fast. No one had time to to get to know her unlike Catherine. She assumed full time senior royal duties right away. That with the fact that she is a foreigner has made it difficult for her to be accepted. Well said, Charlotte. I have read the same type of comments and it's just astonishing. How can you not like someone you don't even know? Based on pictures? One bad expression frozen in time? Some have even commented that she got pregnant to preserve her place in the BRF, others seem to look forward to a future divorce. These are women attacking another woman, based on nothing. We really need to take responsibility for how we behave toward other women and stop blaming it all on men. Anyone who has been a pubescent girl knows that girls can be vicious to other girls and we don't grow out of it, we just do it differently as adults. I found this article really interesting to read. It's a shame it even has to be written, but highlights some very important issues, I think. I’m always confused when I hear this statement…I get that she is a foreigner, but this day in age with the technology that is available it wasn’t hard to get to know Meghan. She had a large social media presence and didn’t take it down until a couple of months before the wedding; which was a good 1.5 years after they were ‘outed’ as a couple. Meghan’s philanthropic work was also available to everyone to see. Even now it is every clear where Meghan’s interest lie… women and education are that the top. She is also very supportive of Harry’s interest in the military and mental health. Whereas per KP words Catherine is still learning and discovering her interest 7+ years into the game. There is already demeaning comments about her being a social climber/gold digger and countless articles about how much her clothes cost. Can you imagine the uproar if she hadn’t started working (assumed senior royal duties) right away? The pearl clutching would have reached epic levels. To me it seems like it is more than just not knowing Meghan or her being or even divorced (3/4 of HM’s kids are divorced) those are just what people feel are the safe topics there use to explain their disdain for her. Anonymous 17:35. A very small segment of the population was aware of Meghan's social media presence. Most people didn't know who she was until she was publicly linked to Prince Harry. Also reading about a person's interests and achievements on paper is different from getting to know who they are. Mannerisms, the way a person speaks, how they react in specific situations, how they perform as a royal are things that slowly come out after many public engagements. She is still a stranger to many people since she is only newly in this role. Being a royal isn't about a resume, it's about how you approach and grow the role. That takes time. Very sorry you feel you must put Catherine down. I don't think being the brainchild of Heads Together and meticulously piecing together an early childhood initiative as well putting her support behind more than a handful of very worthwhile charities while raising three children is still learning and developing her interests. I agree. I don't think the dislike comes from her former profession or that she is divorced. I think her introduction into the family was fast and not well handled. Thank You Charlotte for your post. There is so much negativity regarding her right now, no matter what she does people seem to find a reason to put her down. I feel sad and frustrated on her behalf for the amount of hate that she gets for just being herself. She's done well in all her public engagements she's had so far, and she's interacted with everyone in a very friendly and professional manner. I never cared for the royal family before Meghan came onto the scene - mainly because I found the whole idea (and still do) of the existence of a monarchy in the age of democracy ridiculous, but when Meghan came in and I learned about her background and her work - it got me interested. I don't know much about Kate and she seems like a very kind person - but I could never and still cannot relate to her (btw I am not criticizing her) - she has come from a privileged background and her family was able to provide her with everything that she needed to grow (which is great btw!) but Meghan is more like the average person - we have to work extremely hard to achieve our goals! She encountered failure when she couldn't pursue working as a diplomat initially, but she continued on and went into acting - which is a constant cycle of failures until maybe someone will hopefully cast you in a role. Her entire life has been a constant struggle, grappling to make ends meet by working small parts in films and shows, and then finally she got a regular part in a TV show (not a small feat btw). Which is why I personally find it difficult when these "verteran royal reporters" write stories that compare Kate and Meghan with Meghan always being criticized (called fake, the interloper, a social climber) to elevate Kate (of course not Kate's fault but rather the reporters and royal commentators). It's extremely frustrating to watch this - she wants to work hard and do well in her role, and so far she has done well! She's worked privately with the women of Hubb to write a cookbook, conducted a 16 day tour while pregnant and still continued going on public engagements despite being harassed by the tabloid press via her father and gossip based stories on a daily basis! What more can Meghan do wrong in the eyes of these women who continue to slander and criticize her because "there is just something about her." What is more appalling is the amount of people who wish for both of them to divorce, Kate has been criticized in the past, but I can't recall anyone wishing this on her! It's beyond disgusting. I am an American, had no idea who she was, she is not a known actress in America....all this talk is crazy. 02:57--you made a statement that I feel is important to note: that it is not Kate's fault if royal writers criticize Meghan. Yet, the backlash usually falls on Kate with a sort of compensatory for Meghan or worse fault being pointed out in Kate. I think it works the same way with criticisms of Kate. Let's put the blame squarely where it belongs--on the tabs and writers and commenters who spread this incendiary trash. I don't think we should help the spread by repeating it. If someone here had not brought up the boo incident I would not have known about it. Instead, we have a rather long thread that calls attention to it. I don't know what the plan was behind this boo tape (full disclosure--I have not watched any video/audio clips of this) but if it was intended to make Meghan look bad, it back-fired. She came out looking like a martyr. I am sure the controversy was rewarding for some source. It coincidently did provide an opportunity for some to claim or hint racial motivation. None of this is helping Meghan in her adjustment to her new world. And it certainly exacerbates the polarized atmosphere on the internet. The more we talk about a subject the more notice it will be given. If dedicated Meghan fans are behind spreading this story it is not an effective way to promote Meghan. And if Kate fans promote it--it just encourages backlash on Kate. Not helpful. In my opinion. The fact that they signed a two year lease that they are now giving up confirms my gut feeling that baby Sussex came on the scene earlier than they expected. Not that they didn’t plan to start a family soon, but their doctor probably also told them it can easily take up to a year to fall pregnant, especially if you are in your late thirties. They probably planned to use NottCott and the Cotswolds till the summer/autumn and then move into their permanent residence. But babies come when they want to, so they had to move the timeframe up. Please stop this fake news. I believe you heard what you wanted to hear. For those asking for the video please go to the other post from Charlotte on the Royal Albert hall visit or go to you tube and check The Royal Family Channel. View the video of "The Duke and Duchess arrive in Royal Albert hall". They clapped, cheered and a few HOOTED, not booed. And I had to listen back to even hear it (hoot) from the loud clappings and cheerings, so it comes down to you hearing what you were listening for and that is just so sad. How can you even imagined they were booed. And I did take time to rewatch before commenting. The people gathered there FOR them. To SUPPORT them. Why on earth would it be conceivable that they booed? That would be a joke on themselves. Please DISREGARD this rumours. I don't know what the benefit is supposed to be but it is tasteless. Prince Harry stated in his confessional that he finds huge crowds unnerving and that I believe was why he was a bit shy with the light been shown on them. If they had booed them Prince Harry would not have given them double thumbs up and a thank you hand. Say what you want, it is your opinion, but I don’t want to hear people boo Harry and Meghan. And I heard what sounded like booing. What was Harry supposed to do? Start screaming at them and shame himself and his wife and the charity they were supporting? If you thought they were hoots, that’s fine. Some of us heard boos, but I don’t think we all want them booed. Thank you Paula for saying this. I did go back to rewatch the videos and I am very surprised (although I really shouldn't be) that someone could be that malicious and spread such a lie. There are so many women who go on Meghan centric or Kate's blogs with their fake concerns and it is sad to see. They try to sow discord or just plant pure lies. And they all try to preface everything with "I like Meghan but...". Sigh. Anyway, I will just enjoy Charlotte's excellent blog and will try not to read these comments. Sorry, Mae, but I am confused by your comment. I don't think anyone here was spreading a lie or even intending to. I was also very skeptical about the booing, mostly because I couldn’t believe that people will actually do it, it is the Royal Albert Hall, not some sports match after all and it did not get any mention anywhere. So I also went to watch the video and to my surprise there is something (right al the start of the cheering) that I can’t explain in any other way than somebody who booed. Let’s not take it out of context, it was a lone voice amid a bunch of cheering but even so, I could not believe anybody would have such bad taste. But also let’s not accuse people of lying/spreading fake news because you do not agree with their comments. Without a professional video it would be impossible to say for certain but that is what it sounded like to me too. And yet! I followed the ceremony and at no time was the couple booed. It is quite the opposite. They were highly acclaimed and congratulated with cries from both sides. Besides, there’s no mention of that anywhere. Attention to this type of false information launched so quickly without prior research and verification. It’s too easy to say anything and it’s hard to fix the damage. I listened and it sounded like cheers and hoots to me. The point is not to say that the will was not to spread fake news but to know that we must thoroughly check all information before bombing it because the evil when it is released, it is released. In this case, if this situation had been an ounce of truth, the situation had to be quickly reported to the media by people and especially those who were at the origin of this situation in the room. And our highly informed Charlotte had to be kept informed of the situation with her sources. So you have to take the time to think carefully and take the time to verify this type of information taking its source from a personal impression before sharing it. We have to stop talking about anything without having taken the time to fully understand the situation. No one was booed but just screams of joy of all kinds to cheer the Sussex couple. You think that if that were the case, the media should not leave you alone to know this situation, which had no chance of being true, given the context of the evening. Think people. If there were such booing don't you think it would make headlines? This took place at the Royal Albert Hall - not some sporting event in America. When Europeans "boo" they whistle loud and long. I'm surprised the blog admin has not pointed this out. You can always find something to be offended by if you look hard enough. The question is, why do you want to be offended? Thank you for taking the time to explain this. I’m American and we definitely “boo” but I didn’t know that Europeans whistle instead. This has helped a lot. I was never trying to spread lies or tear Meghan down with false sympathy. I just heard something which to my American ears sounded wrong. Now that I know it wasn’t booing, I’m relieved. Thanks Becca for respecting me having my own opinion. I call it fake news because so many false statement followed the claim of booing. Somebody wrote that Prince Harry had a stony face. There a still pictures of him at the time there were been cheered and there was certainly not stoniness to his face. Mentions about a perceived boo (which at best was a short period of good hearte hooting) when you could unmistakably hear accolades of clapping and cheering that the people spreading the boo concept omitted to mention. So to someone who had not watched the video the imagination would be an uproar of booing to their introduction. So as stated, I believe it is a manifestation of the expectation from the mind for you to imagine that people who willingly gathered in the Royal Albert hall to support Sentebale charity projects were booing. Just glad that people are corrected from the wrong pictures that were being sown. I do hear boos and whistles in the video? Maybe those boos and whistles were supposed to be positive towards them. I don't know how to explain since english is not my native language, but in my country (not england but in europe) whistles are seen as a tacky way of praising someone, you clap and whistles. Not that I'm saying someone in the public was tacky, just a little thrilled because Meghan and Harry were there! Hope it helps! As I said before, nobody on this post (as far as I know, at least in the comments I've seen) have deliberately wanted to tear Meghan and Harry down. I know, for my part, I've been saddened by the hatred Meghan has received across the board. Whether any of us did or didn't hear booing is beside the point, in my opinion. Just because some DID think they heard it doesn't mean they are trying to tear Meghan down or spread false news about her. All of the comments have been about how shocked we are at the treatment Meghan has received in most of the media outlets. That's what is surprising to me. I feel that those of us who thought we heard it were saddened because Meghan has already been trashed enough in the media, lately. I don't think any of us are perpetrating that in the least. I know I'm not. No idea where people got booing from. Think about it logically for a moment. This is Royal Albert Hall in London, a Sentebale charity night, the spectators are there explicitly to support the charity event where royal patron Prince Harry and his wife Meghan are the most important people, apart from Cirque de Soleil itself. People were greeting and cheering Harry and Meghan and were happy and present to support this important cause. If anything I think Harry looked a bit emotional. It definitely sounded like it to me, but whether there was or wasn't is beside the point, in my opinion. As I said in the above comments, those of us that heard it (or thought we heard it, whatever) were shocked at yet another show if ill-will towards Meghan. That's literally the only point I was making. You are entitled to your opinion, Becca. I just don’t think that this kind of crowd would show ill-will towards Meghan, they have no reason to as they are there to support the cause. Thank you Charlotte for your insightful comments. It got me thinking. Meghan was going to be a lightening rod no matter what. The reasons are many- some complex and others more straightforward. Charlotte was spot on that there were those critics who disliked Meghan from the get go and nothing she does will changed their mind. One of Meghan’s biggest obstacles has been the tabloids (and their readers -people should check out the demographics of the Daily Mail readers for example). If you look at the tabloids and their political leaning, it’s not a surprise Meghan was going to face negative press. Truth doesn’t have to have a place here. Hearsay backed up by hearsay from some unnamed palace aid or courtier is good enough ‘fact checking’ to run an article. Taking facts, but leaving out crucial context and spinning it into a creative narrative far from the truth is another favorite tactic. Using such adjectives as ‘mental’, ‘feuding’, or ‘out of control’ in the headline grabs readers to click these articles and videos. With every click, that’s $$$$ to these media outlets. Follow the money. Add human psychology where researchers have shown humans tend to retain and act upon negative emotions such as hate and fear far more than happy feelings, then this toxic mess is more understandable. Researchers have also shown venting anger makes people happier. It’s why politicians (and hostile countries) win with negative ads, fake news and rile up their target audience with fear and hatemongering so easily. This toxic brew energizes people to action. And that is KEY. So when people read stories that support, in their mind, their opinions and actions, they will continue to seek them. This is human nature. We all need and seek positive affirmation. We want to be right and in the right. Our world presently is facing tremendous social, political, environmental and economic challenges. People take solace in a variety of ways. Some find it through distraction or through helping others. Unfortunately, there is also a large subsection whose anger finds outlet in using people or individual as scapegoat. Social media and the internet makes it easy for us to be manipulated and to take part. It is in this uncontrolled void that unscrupulous people will take advantage of our very human foibles. OK. I re-watched the video posted on this website by Charlotte and I did not hear any booing! With the smear campaign against Meghan by SOME sections of the UK media, if such a thing had occurred, it would have been FRONT PAGE NEWS! I re-watched the video as well and I didn't hear any booing. What I heard, was a few people hooting. If there had been booing, it would be all over the tabloids. Thinking about Prince Phillips accident the other day and realized that I haven't seen any of the royals wearing seatbelts, at least not the should belt which could be seen when they approach their engagements. 1. There’s definitely a racial element behind the way Meghan is treated/viewed/received...she is after all a biracial woman. There are some people who will never like her, may even hate her because of this, may even see her as unworthy to join the BRF....irony alert, since all the Royals are Queen Charlotte’s descendants...Queen Charlotte was herself a mixed race woman..
2. What, pray tell, did she ever have to prove? And to whom, for what, and for why? Any person, any woman, who is comfortable in her own skin and knows her worth, knows that at the end of the day, if you are living an authentic life and doing affirming things, you don’t have to prove anything to anyone, least of all your detractors. 3. For those who feel the British people didn’t get a chance to know her...sigh..read read read...get off the Daily Mail and try to read unbiased stories that are all over the internet about her...when most of us were 11 years old, we were not writing letters to Protor and Gamble...she was...how mush time did they need? 10plus years that Kate was with Will? So she and Harry are supposed to guide their life choices by whether people know her? Utter nonsense. 4. Meghan is and will probably always be (at least for awhile) clickbait...stories about her, good or bad, sell..do your part and skip the slime...it will always be there...I no longer listen to On Heir when it became apparent that Emily Andrews has an obvious bias against Meghan.. I do not agree there is anything biased based on race. One of the things I learned from following Kate, from even before her marriage, is that you need to have a strong hand on who you follow and give time to. Over the years I have followed and unfollowed a number of royal reporters, bloggers and commentators until I curated a list of reliable source that is neither over critical nor just fawning supporters. Sadly due to the toxic nature of royal watching some of my most reliable and balanced sources are closing up shop because even the most balanced opinion gets buried under abuse. Ali, when their relationship was announced Prince Harry spoke out about the racially charged headlines and stories about her. Just because you don't have a problem with her racial background doesn't mean plenty of others don't. Some of the things people comment about her under positive stories are horrible. There have been any number of racially based remarks about Meghan on social media. I've read those myself. It's inevitable, of course. A sad world, this. Then there's being a frightful American, poor dear. I believe that's a part of many "Why is she wearing X?" comments, especially the "Hollywood" and "Kardashian" snark, which is inaccurate. It's a different fashion perspective than a certain part of upper class British society. Her confidence and outspokenness will seem foreign too. ali have you even gone to kensington's instagram? Racial insults fly so fast that they cannot even delete them in time before the next racial slurs come forth. No, I have not visited KP IG. Now that you report the racial slurs, I do not intend to visit it and thereby support and encourage the slurs. It might be helpful to write a letter of protest to the operators/owners/publishers of such a site protesting the language. Then follow it up with not clicking on the site again. Simply arguing with the commenters involved will only encourage them. Attention and recognition is their goal and they are not picky about whether it is positive or negative reinforcement. The problem with some forums is they print just enough favorable material--the DM has great photos--to overcome people's scruples concerning the objectionable content. Twitter just removed the account of a source that had included inflammatory and slanted/altered material. Possibly after pressure from influential sources. If enough people put pressure on sites that allow their comment sections to run wild and thus attract clicks--the site would be forced to act. I don't think only avoiding the comment sections will have the same effect as by-passing the site completely. By clicking on such sites we are supporting them and the trash that goes with it. The trash won't stop until enough people of conscience refuse to click on it. Oh my no idea. No i do not follow or read many comments except on a few blogs like this one. Just assumed negative criticism was just nasty comments by people stirring up trouble, had no idea actual racial slurs were made. "Whoops, hoots, boos, cheers'"...all describing the same noise. It would seem malice as well as beauty is in the eye/ear of the observer. That describes bias or perspective. If Harry had been standing there alone would this discussion take on another slant? From racial bias to political bias. Those who favor Harry claim cheers -or boos, but it was from republicans and anti-monarchists.. Same noise, different person--different interpretation. By the way, I watch the British Parliament from time to time. There is definite booing involved, sometimes stomping--not whistles. Meanwhile, there was a recent credible on-line call soliciting Kate's death by poisoning. Her son George's life was threatened at school. Harry is supposedly on a hit list because he was a helicopter gunner in Afghanistan. And we are debating the POSSIBILITY of a maybe single boo? Anon 23:22-what was your favorite part of the show? A performer was injured badly or killed in a performance in Las Vegas, I believe it was. I think I would have watched most of it from between my fingers. Also,I have always wondered if there is some screening of audience members when a royal is present. Were advance tickets required? Searches of bags etc.? Royal security makes extra security sleeps prior to the arrival of the royals, but try their best to blend in with the crowds once the royals arrive. Post 9/11 most facilities such as the Albert Hall have lecturing lprotocols for all gusts in place, not just when royals are present. Guest lists/invitations are reviewed by palace protection teams before hand to screen for potential threats. However, once the premises has been secured and the royals have arrived they event continues like clock work in an attempt to maintain a level of normalcy and decorum. Charlotte, very interesting that you allow criticism of Kate on this blog and DK but none of Meghan. Hello Anonymous, two points on this if I may. 1) No, I do not allow posters to bash Kate here or Meghan on DKB. That has always been my policy. It doesn't mean I ban any mention of them, occasionally posters use Kate or Meghan to reference a situation or make a point. If I see a conversation heading in the direction of tearing one down, I shut it down. 2) If you read the comments section you'll see Meghan is very regularly criticised here. Take this post for example. 👏🏽👏🏽👏🏽👏🏽👏🏽👏🏽👏🏽👏🏽👏🏽👏🏽👏🏽👏🏽👏🏽👏🏽I am sooooooo glad you said what you said, Charlotte. We must stand tall and simply tell it like it is. Thank you Charlotte for your courage to speak TRUTH. Even now in the media they’re trying to make an issue out of “Kate didn't invite Meghan to her party”. Oh my! So sad!! I do know one thing. 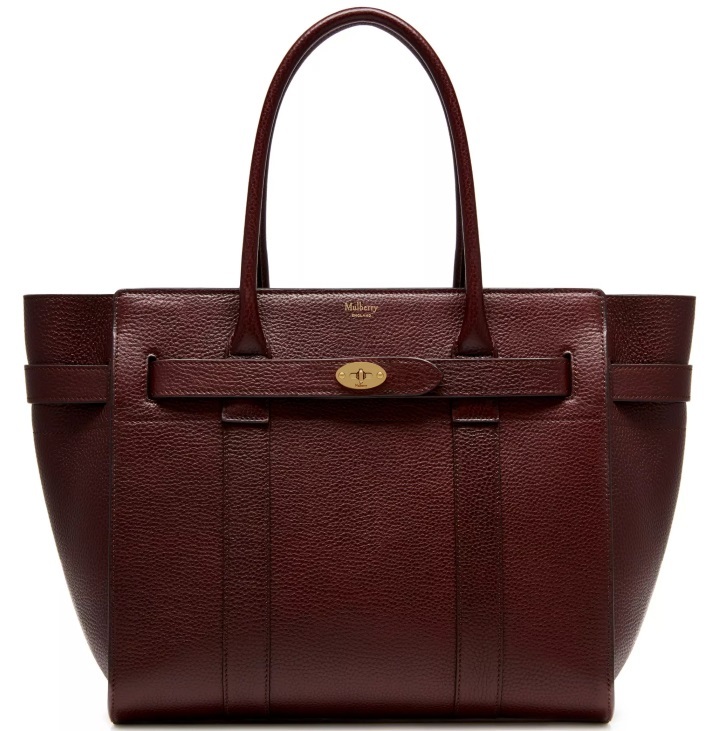 And that is I would love to have that Mulberry tote! In general, I have major Meghan's Handbag Envy. I agree. Oh how I wish to be a fly on the wall during this meeting, https://people.com/royals/meghan-markle-private-meeting-jacinda-ardern/. I thrilled to see Meghan building relationships with other female leaders, especially leaders within the Commonwealth. As Charlotte, stated above it's a shame that more attention isn't paid to the time spent and work done by the Duchess, she truly is inspiring. I'll just say it here, because there were several different threads that took off: whether you did or didn't hear booing, I think we can all agree that we're for Meghan and are saddened by the way she's been treated in the press. 1. Meghan, Harry, and their offspring will be fine...I don’t know Meghan, but we all know that after dealing with the vitriol from her father’s family, and apparently doing so for years, she can withstand the ugliness...aside from that, I doubt that she is walking this journey alone and can turn to not only her husband, but hopefully family such as Charles and Camilla, and hopefully friends such as the Obamas. I would think that especially Michelle who walked a somewhat similar path to a Meghan’s, can give her invaluable advice. 2. One thing I’ll say as an American and a professional woman, in many respects I totally get Meghan and can sense why she does or is the way she is...when you love someone, whether or not that person is a Prince, when you share the same passions and interests, that itself is the glue that holds...add a child to that mix and their family unit, happiness, and purpose will always be taking care of that unit. 3. One would hope that their union would be idyllic, but in a sense all the negativity will probably make them more determined to prevail..I believe that what she has gone through has made Harry respect her more, and if there’s any truth to the rumors that Harry was irate at William, future King or no, Harry’s commitment to her would only have deepened her love for him. Well said, Anonymous 3:09. It's disgusting to trash a woman who is without a doubt hard-working, creative, and committed to her husband, their shared life's work, and its seems now a family with which they will be blessed. It's absolutely puerile on the part of the press to expect Meghan and Kate to be BFF and if they do not appear to be, then they must be feuding. Meghan herself said in her engagement interview that Kate had been wonderful. Kate and Meghan are two mature women who grew up in different countries and have each developed a close knit group of friends. Of course they would continue with all their friends. They don't as yet seem to have any friends in common which is to be expected. As Harry said during their Foundation forum, they're family and stuck with each other. I think they will support each other their whole lives which doesn't mean spending every week-end together and living in each other's pockets. The press and the haters will continue to make up or slant things to keep as many people as possible reading their garbage and using the space to vent their resentment, jealousy, and racism. Meanwhile, Meghan and Harry inspire many others with their love and charitable works. From the moment I took the time to read about both Harry and Meghan, I have heartily wished them well always. I love how she is having private engagements. That keeps her from critisism. I think you’ve got it. I don’t think Edward and Sophie have two homes. Of course William and Catherine do, but th other working Royals might not need a home in London like theirs. They can educate their child(ren?) locally, as the Wessex’s have.. Fromore security upgrades will be a fraction of refurbishing a London residence. I believe the Wessexes, and the other royal family members who live in the country, have flats in the London palaces where they can spend the night when their schedules require them to be in town.